It’s Friday. Wow… time just flies so far and here we are in October. Trees on our backyard is changing colors, that for sure Fall is in the air. Today is time for Stuck On U Sketches Die Cut Challenge. The new challenge theme is WE’RE ALL MAD HERE. It has challenged me to think hard for this one. But our team is awesome, they came up with a lot of ideas for this challenge that you can use any of these die cut shapes for your project: a top hat, tea cup, tea pot, saucer, etc. You also can go all Alice In Wonderland idea if you’d like. Totally up to you, but this is another one to totally go crazy with your project 🙂 Link you your finished projects here to win our monthly blog candy! I picked the tea cup and saucer for this challenge. I found Lori Whitlock Tea Cup easel card at Silhouette Online Store and cut the shapes using my amazing die cut machine, Silhouette Cameo. Super cute, love that tea cup! Love this easel card…and the tea cup and sentiment are perfect! Really neat! Any tea-loving crafter would adore getting this in the mail! Thanks for sharing. Super Sweet Helen! The flowers are a fabulous touch! 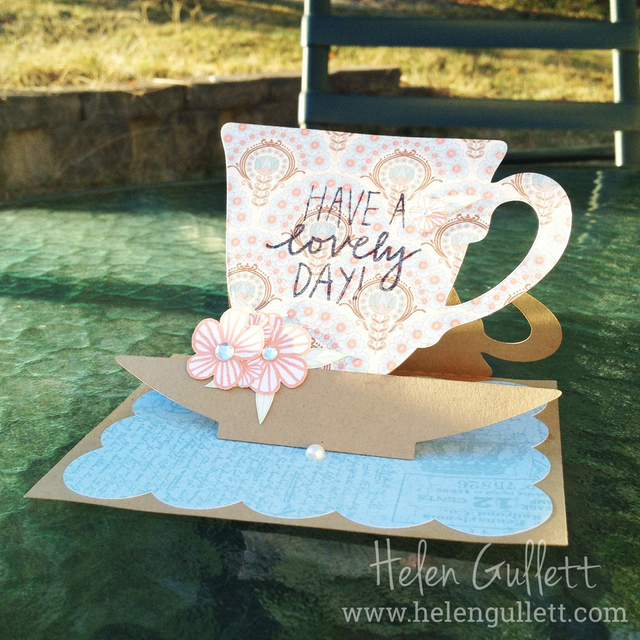 Very pretty Hellen…….love your sweet cup and saucer!